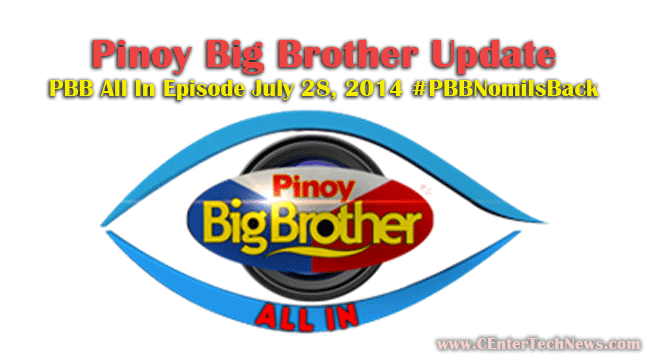 Pinoy Big Brother Update: PBB All In Episode July 28, 2014: It has been a long week for the housemates for there were so many things that took place inside the PBB house not just in terms of tasks and the like but in between the housemates. This episode of Pinoy Big Brother will tackle about the relational and emotional problems that have happened inside the house among the housemates. The housemates went through a lot of things before performing in front of the three judges during their grand concert. First up is the situation of Joshua and Jane which became awkward a few days after her debut. We have known that during the debut of Jane, her suitor from the outside who is basketball player came in to celebrate with her. When he came in, Joshua had this reaction on his face. The issue now is on Joshua since on the episode, Loisa talked to him and said to him that Jane liked Jeron than him and she didn’t have feelings towards him. This has made Joshua down and admitted that he had this feeling of jealousness towards the guy. Loisa tried to comfort him and made him smile. This has supposedly turned good but Jane was upset with the conversation of Joshua and Loisa since according to her, the messages that came to Joshua were not what they should sound like. On the other hand, Vickie was still restless with regards to the message that was sent by her to her boyfriend Jason Abalos. We have known for a fact that the two had this misunderstanding because of the message that was sent by Jason without “I love you” in it. This has made Vickie troubled and restless. Big Brother then said a good news that made Vickie both excited and tensed. Big Brother then prepared something in order for Vickie to locate through a word hunt the words of the messages that Jason have sent. Vickie did a great job on this. The housemates were all nominated this week and this is when friendship is tested because they will have to choose, each one of them, who will be safe from the nomination. The hardest part is that they will only have to choose one. Who will be nominated this week? Who will not be included in the official list of nominated? Well, let’s see. Let us keep watching PBB All In.